Max and Live: Aptly Named! It isn't often that big things happen in music technology these days. The market has been pretty mature for some time, and apart from refinements, it has been pretty quiet - as have I! This isn't a coincidence - I stopped doing synthesizer and sequencer reviews when I figured that we were at more or less the peak of technological development, and it has been quiet ever since - just gradual minor improvements and the 'things discovered/invented ages ago finally becoming possible/affordable because of increases in processing power' effect. So it is really good to be alive and present at something truly huge: Max for Live. Why is this a momentous event? Because it is the first time that what I call host software, and others call DAWs or sequencers, has changed the way that it fundamentally works. Up until now, the sequencing/audio software that acts as a host for audio/instrument/processing plug-ins (VST, AU, etc) has not allowed you to do anything much with how the hosted plug-ins have worked internally, or how they have integrated into the host - the only route has been to write your own plug-ins or your own host software ( or go down the Reaktor route). But Max for Live changes that, forever. 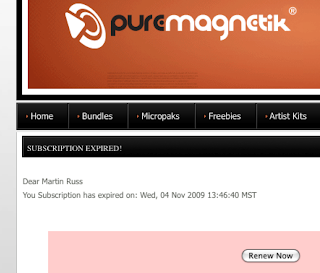 I've enjoyed a full subscription to the excellent PureMagnetik website for the past year, and I have to say that it has been completely worth the money. The quality of the samples, sounds, instruments, effects and racks in the down-loadable Micropaks has been uniformly superb, and I thoroughly recommend it for anyone who uses Ableton Live, Kontakt or Logic. I had a problem with one of the 'Amp' racks in the 'Model C' (Hohner Clavinet) micropak, where I got no sound at all from it. I posted a message on the support forum (The Board) but got no replies at all, so I'm not entirely happy with the support, but then this is the first time I've needed it! For the next year, I'm going to make some samples, sounds, etc. of my own for Live, so watch this space!